Nestled in the rolling hill country at the base of Linville Gorge is Lake James, a beautiful lake with more than 150 miles of shoreline. 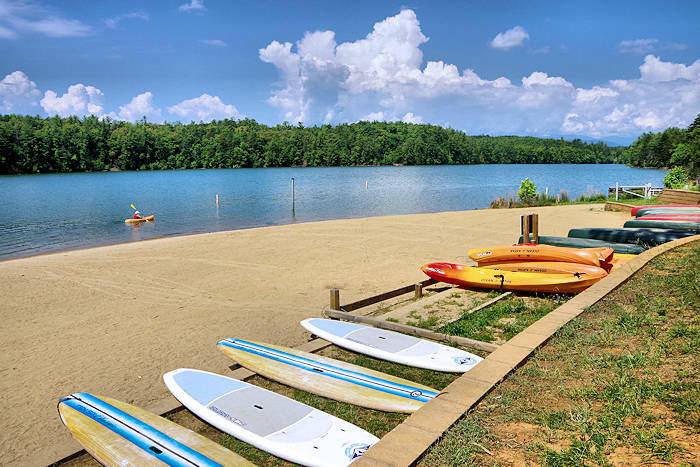 Lucky for us, there is the ever-growing Lake James State Park, a playland for outdoor lovers in the Blue Ridge Mountains. It is free to visit and very convenient to I-40 (about 7 miles from Exit 90). 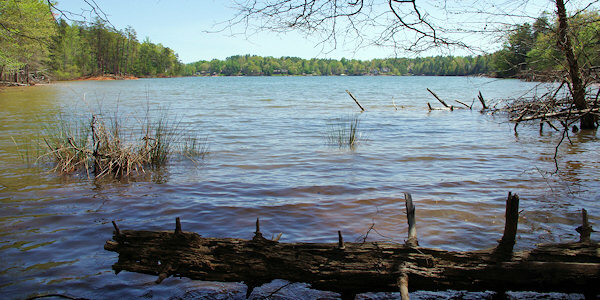 The lake is located between the towns of Marion and Morganton. 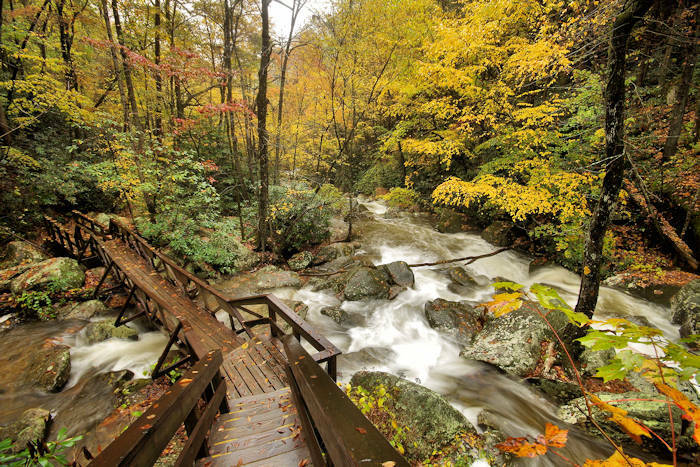 It's an easy 45-mile drive from Asheville. Steep, forested ridges covered with hardwoods, pines and hemlocks dominate the landscape. Wildflowers commonly seen in the park include pink lady slipper, Jack-in-the-pulpit, passion flower, Indian pipe and cardinal flower. Mountain laurel, rhododendron and flame azalea are also abundant in the hilly terrain. Deer, flying squirrel, red and gray fox, rabbit, muskrat and mink all reside at Lake James State Park. Waterfowl - including green heron, belted kingfisher, mallard and Canadian geese - enjoy the park's large body of water. Most of the park has been developed just in the last 10 years. There are two areas of the park to explore: Paddy's Creek and Catawba River. They are just a few miles apart - and they offer different things to do. It's like having a 2-for-1 park. Sun and swim at our favorite beach in the mountains! At Paddy's Creek, find a large, sandy beach with a designated swimming area. A nice pavilion has restrooms and concession stand, along with plenty of parking. The beach is open for swimming May through September. Read more about the beach. 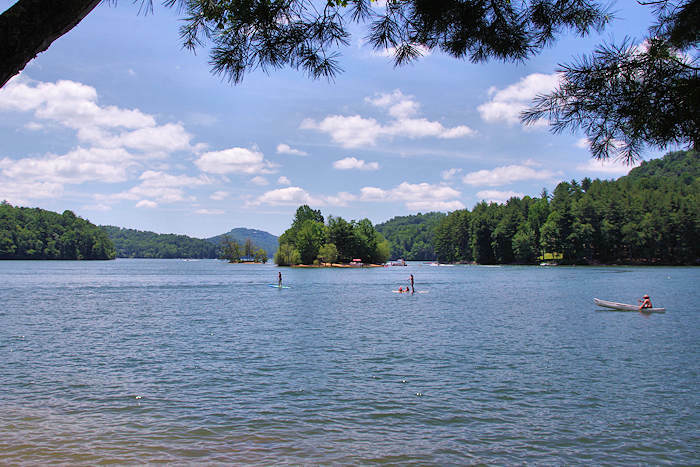 Two boat ramps, Hidden Cove and Canal Bridge, offer access to Lake James for power boats, sailboats and smaller crafts. Both boat ramps are located along NC-126, two miles east of the park entrance. Hidden Cove operates according to park hours. Canal Bridge is open 24 hours. Canoes and kayaks are available for rent from the park - including at the beach. Canoes hold 2-3 people and kayaks are just for one. Nearby, a number of other launching sites and marinas offer boats and motors for rent. Fishing tackle, bait, ice and snacks are also available. 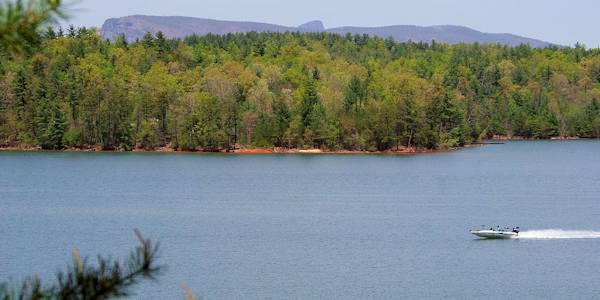 Hike a relatively new trail system at Lake James State Park, with eight trails for all fitness levels at both the Catawba River and Paddy's Creek areas, including the .75-mile Holly Discovery Trail, a one-mile section of the Overmountain Victory Trail, and the Lake Channel Overlook Trail to a scenic vista. In 2012, the Mill's Creek Trail Loop was added at Paddy's Creek, a 3.6-mile loop that can be combined with other trails that were opened in 2010. 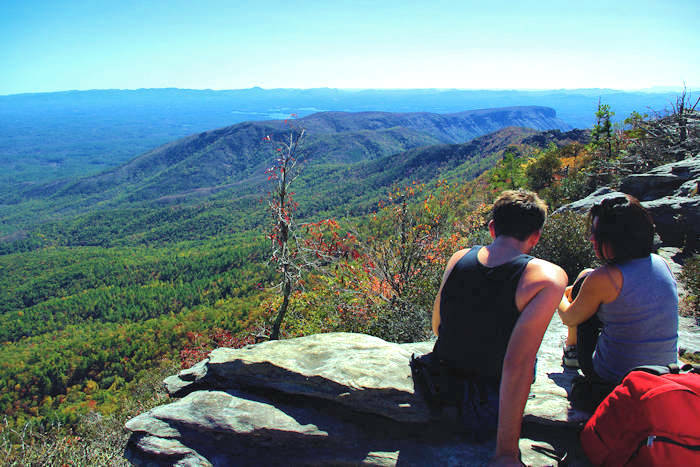 Rangers give frequent guided hikes and nature programs at Lake James. Go to their calendar of events. Find 15 miles of mountain biking trails at the Paddy’s Creek area. The four-mile Tindo Loop (blazed with blue circles) is an easy beginner's trail. The 11-mile West Wimba Loop (orange circle) and East Wimba Loop (red circle) are for intermediate riders. 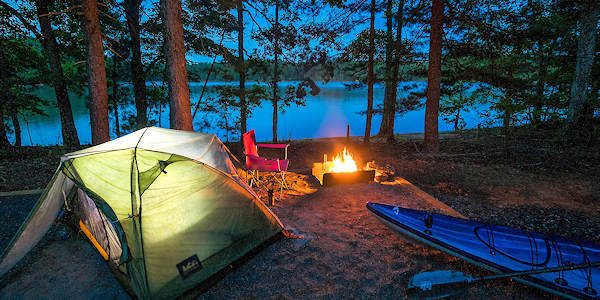 20 walk-in campsites (short walk of 150-300 yards) are located along the shoreline at the Catawba River area - with fire pit, picnic table and space for a six-person tent. Washhouse and hot showers. 33 drive-in sites at the Paddy's Creek area with parking for two vehicles, fire pits and washhouse. Open year-round. Reserve a campsite. Added in 2015, paddle to 30 campsites along the Long Arm peninsula of the park, about a mile away from the beach. The reservation-only campsites are furnished with picnic tables, fire pits and tent pads with access to vault toilets. Canoes and kayaks are usually available to rent. Reserve a campsite. 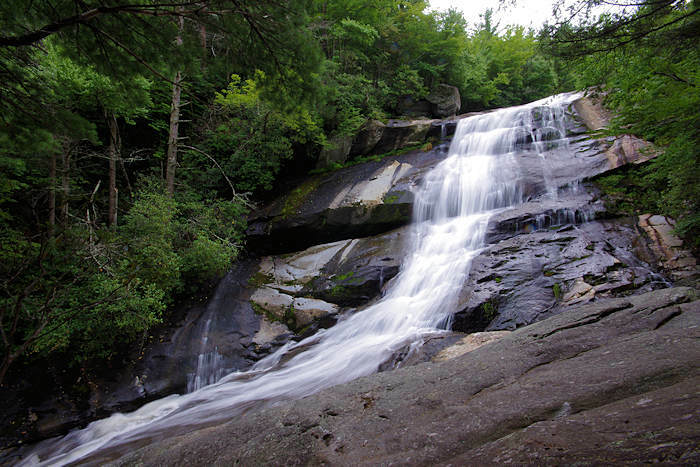 The cool mountain waters of the Linville and Catawba rivers flow into hilly terrain to form a deep lake with enough points and coves to challenge any fisherman. Water level fluctuation, due to hydroelectric power production, keeps aquatic vegetation to a minimum and concentrates fish populations, especially in winter. Cool, deep waters and warm surface waters provide a variety of sport fishing. Largemouth bass is the most sought-after fish in the lake. The early morning and late afternoon hours from April through October are the best times to angle for this tackle-buster and its smallmouth relative. Walleye, first introduced in 1951, is another prized game fish in the lake. White bass spawn in May, and crappie fishing is best from May through July. Bluegill, robin and catfish are available year-round, and record specimens of muskellunge have been caught in the lake. Other fish include bream, sunfish and perch. A fishing license is required. All Wildlife Resources Commission regulations apply. Picnic areas available on a first-come, first-served basis at both the Catawba River and Paddy's Creek areas. Picnic sites include tables, outdoor grills and trash and recycling receptacles. Drinking water and restrooms are located within a short walk of all picnic sites. Find lots of picnic tables scattered along the shore at the beach at Paddy's Creek. Pets must be on an attended leash no longer than six ft. No pets allowed on the beach. Hike to High Shoals Falls at South Mountains State Park. For other local attractions, visit the Burke County website. 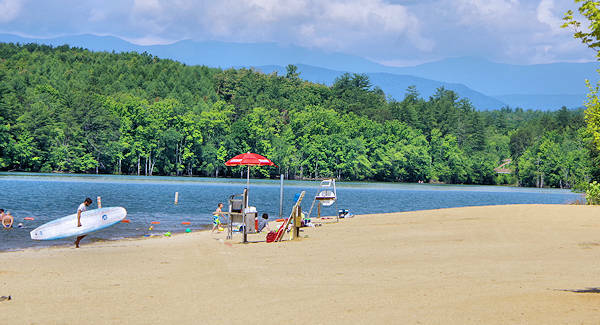 To Paddy's Creek Area of Lake James State Park: Traveling east on I-40 from Asheville, take the Nebo/Lake James exit (exit 90) and head north. After a half-mile, turn right onto Harmony Grove Road, and follow it for 2 miles to a stoplight. Proceed straight across the intersection and past Nebo Elementary School to a stop sign. Turn right onto NC-126, and follow the signs to the park entrance 4.8 miles on the right. 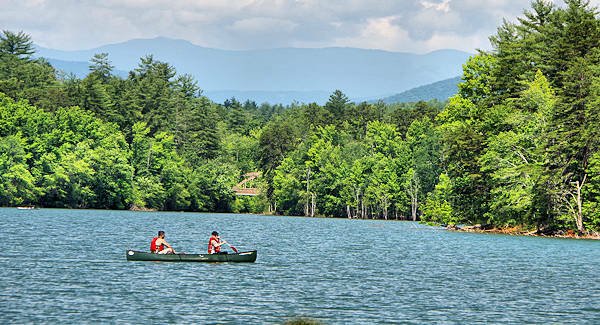 To Catawba River Area of Lake James State Park: Traveling east on I-40 from Asheville, take the Nebo/Lake James exit (exit 90) and head north. After a half-mile, turn right onto Harmony Grove Road, and follow it for 2 miles to a stoplight. Proceed straight across the intersection and past Nebo Elementary School to a stop sign. Turn right onto NC-126, and follow the signs to the park entrance 2.3 miles on the left.